Well drained soil amended with well rotted compost. In lean soil, mix in a balanced organic fertilizer before planting. Beans, Beet, Celery, Cucumber, Lettuce, Potatoes, Onion and Onions. Sow in early spring indoors, or outdoors when the weather is warm but the soil is still cool. Easier to grow than broccoli, especially in spring. Can be sown in late summer for a fall crops. Pull plants when swollen stems are the size of tennis balls. Older plants have inferior texture. 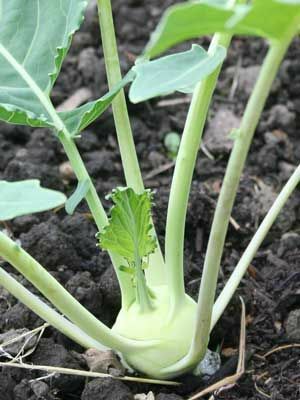 Cabbageworms can be damaging, but they are less attracted to kohlrabi compared to other cabbage family crops.